Face Washing... Are you doing it right? Face Washing… Are you doing it right? Your skin care routine starts with face wash. It might seem like no rocket science but the truth is of you are not doing it right then you might end up damaging your facial skin which in long term can cause early ageing and decay of skin. So here are few steps which let you decide if you are doing it right. This is the most important step. You should know your skin type to choose products for your skin. “One is not apt for all”. Choose a product according to your skin type. Also if your skin is feeling discomforting or stretchier or oilier than usual, then you are using a wrong product. Choose your facewash wisely and it should be mild on skin. How many times you wash your face with facewash in whole day? 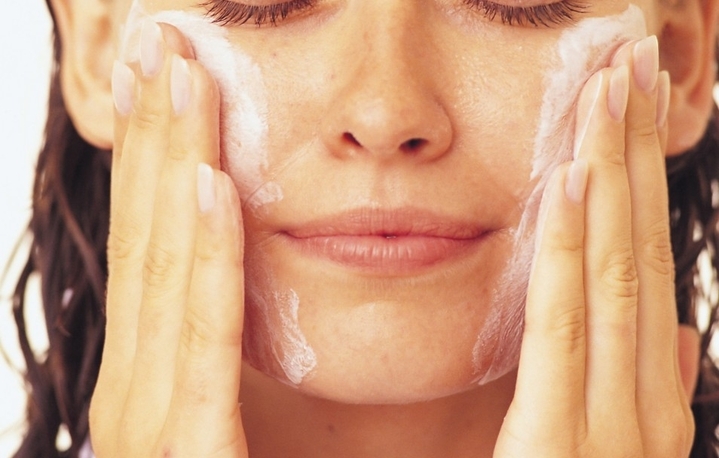 Experts suggest that you should wash your face with facewash twice a day. Max you can upto 3 times a day for using facewash but more than that can irritate your skin and make it loose natural glow. Temperature of water you are using to wash your face is also very important. Do not use very hot or very cold water on skin everyday. Use lukewarm water to wash your face. If you want you can take steam or rub ice on your face once a weak but not more than that. Sometimes girls go crazy scrubbing their face. Ladies remember one thing “overdoing is always harmful”. Use scrub maximum 2-3 times a week even the daily-scrub products are not advisable to use daily, if your skin is that much of a tough fighter then use them alternately. Use salicylic acid based facewash as salicylic acid itself acts as a natural and good exfoliator and it’s not harsh on skin with all the granules and all. If you are in a hurry then either skip using facewash or any other product which needs to be washed out of face or squeeze 1-2 mins of time to wash it off properly. Make sure there is no product residues on skin as this can cause skin irritation and may react to any ingredients from other products. You know the enemy ingredients? If you don’t read the ingredient list then start doing it. Don’t pick up products containing SLS (Sodium Lauryl Sulphate), SLES (Sodium Laureth Sulphate) and parabeans. These may irritate you skin. Choose products with minimum chemical ingredients. Now when you moisturize your skin is also a key point. Always moisturize your skin when it’s still damp, as it will help to seal the moisture required for your skin. And yeah that is a myth that “Oily skin doesn’t need to be moisturized”. Every type of skin needs to be moisturized, choose a product which is best for your skin type. Oil therapy is something which confuses lots of people. But trust me…I’ve used it myself (I have super sensitive combination skin) and godddd it’s effective and true to its claims. It can be used for all skin types (oily skin also). Use olive oil/coconut oil for oily/combination skin and almond oil for dry skin, normal skin people can use coconut oil. Oil cleansing method doesnt work for everybody. I remember i got so many zits within a week of following the practise and since thwn i face the issue of acne. Thank you Purva :).. Oil cleansing works but only if done properly.. One should make sure to clean all the access oil otherwise it can cause trouble.. it’s the best for oily skin, have seen oily skinned beauties swear by it.. If you want I can do a post on how i do it?